As a DBA you must have encountered a slow running application on SQL Server, but there are various factors that could be affecting the performance. If you find yourself in this situation, don't wait, pick up this book and start working towards improving performance of your SQL Server 2012 with this book. SQLHub.com is one of the premium online resource for SQL Server help. 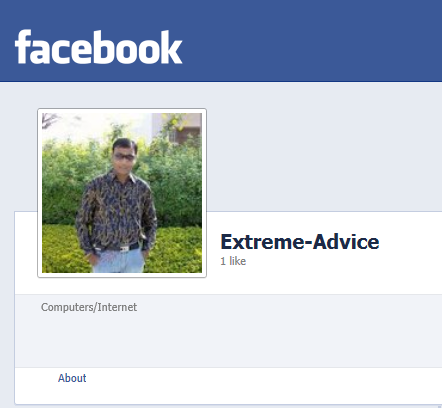 Finally Extreme-Advice community is having its own Facebook page, do check out and "LIKE" too. Extreme-Advice is founded by Ritesh Shah. He is a database professional with having 10+ years of experience in Microsoft technology from SQL Server 2000 to the latest one and from Visual Basic 6.0 to .NET Framework 4.0. He has deployed many medium scale as well as large scale project using Microsoft technology. He shares his knowledge in his blog Extreme-Advice.com & SQLHub.com and also helps community in different portal like BeyondRelational.com, Experts-Exchange.com and Asp.Net forum. 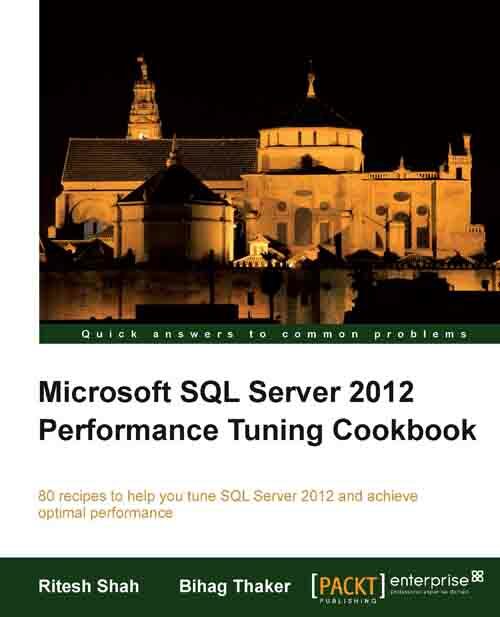 Ritesh is a author of SQL Server book named "SQL Server 2012 Performance Tuning cookbook". It helps SQL Server professional to manage database & SQL Server efficiently with high performance. As a DBA you must have encountered a slow running application on SQL Server, but there are various factors that could be affecting the performance. If you find yourself in this situation, don't wait, pick up this book and start working towards improving performance of your SQL Server 2012. SQL Server 2012 Performance Tuning Cookbook is divided into three major parts -- Performance Monitoring, Performance Tuning, and Performance Management--that are mandatory to deal with performance in any capacity. The post Installing MySQL Server in CentOS 7 appeared first on Ritesh Shah (Extreme-Advice.Com). The post SQL Server 2016 Service Pack 1 appeared first on Ritesh Shah (Extreme-Advice.Com). 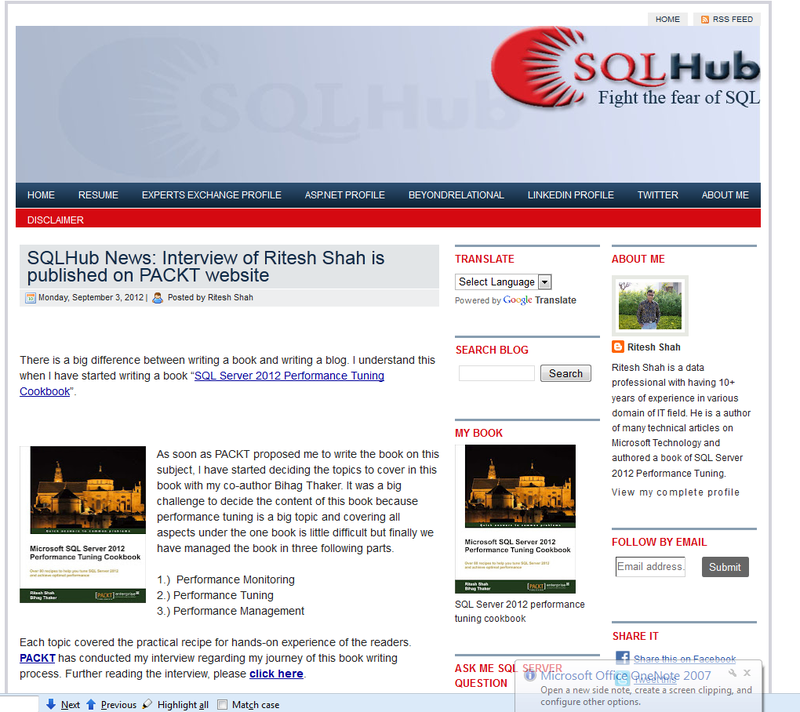 The post SQL Server 2014 CTP 1 available to download appeared first on Ritesh Shah (Extreme-Advice.Com). The post Dynamic filter in WHERE Clause with CASE_WHEN_THEN in SQL Server appeared first on Ritesh Shah (Extreme-Advice.Com). The post SQL Server Login permission to read queue message count of Service Broker appeared first on Ritesh Shah (Extreme-Advice.Com). The post Count active Thread for Service Broker Queue in SQL Server appeared first on Ritesh Shah (Extreme-Advice.Com). The post Error Fix – Replication subscriber does not exist on the server anymore appeared first on Ritesh Shah (Extreme-Advice.Com). The post Bug Fix – Show Result Pane not working in SQL Server 2012 with CTRL + R appeared first on Ritesh Shah (Extreme-Advice.Com). The post Find disabled job in SQL Server appeared first on Ritesh Shah (Extreme-Advice.Com). The post Copy and archive SQL Server database backup appeared first on Ritesh Shah (Extreme-Advice.Com). The post Error Fix Database Mail XPs error in SQL Server appeared first on Ritesh Shah (Extreme-Advice.Com). The post Deal with message queue conversation with state CD in Service Broker appeared first on Ritesh Shah (Extreme-Advice.Com). The post Keep watch on Service Broker Queue Delay in SQL Server appeared first on Ritesh Shah (Extreme-Advice.Com). 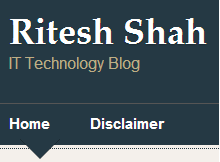 The post Milestone of 500+ article appeared first on Ritesh Shah (Extreme-Advice.Com). The post Update XML attribute value based on condition with XQUERY appeared first on Ritesh Shah (Extreme-Advice.Com). The post Query to Find missing job in SQL Server appeared first on Ritesh Shah (Extreme-Advice.Com). The post Update XML attribute value with XQUERY in SQL Server appeared first on Ritesh Shah (Extreme-Advice.Com). The post XQuery in SQL Server to insert XML attribute in existing XML element appeared first on Ritesh Shah (Extreme-Advice.Com). The post XQuery in SQL Server to delete XML element appeared first on Ritesh Shah (Extreme-Advice.Com). The post WHERE clause on XML column in SQL Server table appeared first on Ritesh Shah (Extreme-Advice.Com). Copyright � 2012 Ritesh Shah, All Right Reserved.